Enjoy the Celebration of Freedom parade in Hobart and witness over 100 entrants of all kinds and descriptions, including marching bands, floats, balloons, horses, cars, tractors and lots of veterans. Memorial Day signals warm weather, a time for reflection and long summer days ahead. This time-honored holiday, created to honor the men and women who have bravely served our country, is a time for many families to hit the road, get out in the sunshine and spend quality time together. 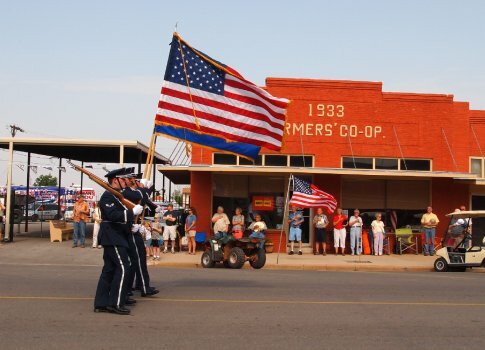 Whether you decide to attend a patriotic ceremony or simply enjoy a weekend on the water, Oklahoma boasts plenty of opportunities to celebrate. The 45th Infantry Division Museum in Oklahoma City celebrates military history in Oklahoma and beyond with a variety of photographs, artifacts and documents on display, as well as an annual Memorial Day Ceremony that includes the firing of a WWII anti-tank gun and music from the Governor’s 145th Army Band. One of the museum’s most prized exhibits is the Reaves Firearm Collection, showcasing infantry and cavalry weapons from the Revolutionary War to the Vietnam War. A visit to the Fort Gibson National Cemetery is a thoughtful way to commemorate Memorial Day. Veterans from the Revolutionary War to the Persian Gulf War are buried at this national cemetery site, where a self-guided walking tour provides the ideal opportunity for reflection. Oklahoma native and decorated Army veteran General Tommy Franks has created a one-of-a-kind museum experience in Hobart that highlights items from his personal collection. The General Tommy Franks Leadership Institute & Museum allows you to experience many facets of military history through permanent and rotating showcases. Muskogee offers a chance to pay tribute to the crew of the highly decorated U.S.S. Batfish submarine at the U.S.S. Batfish & War Memorial Park. This World War II submarine, which sank three enemy submarines and eleven other enemy vessels, sits in a park with an army tank, cannons, missiles and other memorabilia. Make sure to take a tour of the submarine to view the torpedo room and crew cabins. Visit the Atoka Museum, Civil War Cemetery & Visitors Center this Memorial Day and explore this former Confederate outpost that now boasts a variety of Civil War artifacts found in the area. In remembrance of Oklahoma’s storied war history, browse the cemetery that holds the remains of Confederate soldiers who died in 1862. The Heartland of America Museum in Weatherford and Oklahoma Military Academy Museum in Claremore also offer some great opportunities to recognize military men and women with military history displays, artifacts, memorabilia and more. As the weather warms and the days get longer, nothing celebrates the season quite like a trip to one of Oklahoma’s amusement and water parks. Watch your children light up on an adrenaline-pumping thrill ride or cool off in a relaxing lazy river. From a Western-themed amusement park to aquatic centers overflowing with fun, Oklahoma has something for everyone. Take the family to one of Oklahoma’s 32 state parks to uncover all the natural allure the Sooner State has to offer. Climb in a dune buggy and hit the sand dunes at Little Sahara State Park, go caving at Alabaster Caverns State Park or reach Oklahoma’s highest point at Black Mesa State Park. Get closer to nature with hiking and fishing opportunities, or head out for a family-friendly picnic at a state park near you. Get closer to nature with hiking and fishing opportunities, or head out for a family-friendly picnic at a state park near you. With one million surface acres of water covering Oklahoma, it’s no wonder lakes and boating are popular subjects when Memorial Day weekend rolls around. Grab some oars and climb aboard a kayak or take advantage of the Oklahoma wind to fill your sails. Marinas surround almost every body of water in Oklahoma, where there’s plenty of bait for fishing and watercraft available to rent. Swimming, patio dining and lakefront accommodations are just a few other perks of a lake trip. Four mountain ranges, thousands of miles of shoreline and ample space for biking, climbing and hiking make Oklahoma the ideal spot for outdoor recreation. Families seeking fun on the water can pile aboard a raft for a float down the Illinois River or take a dip in a natural spring. On land, saddle up for a horseback ride to see the inner workings of a ranch or head to a family resort for some old-fashioned fun with a round of mini golf. When night falls, pitch a tent under the stars at one of the state’s countless camping spots. There are almost too many family activities in Oklahoma to settle on one for Memorial Day. Browse through our Family Activities section to pick a destination perfect for your family. Catch a sporting event and outdoor concert, or pack up the family and head to one of the state’s award-winning zoos or aquariums. The options are endless. The long weekend and warm weather make Memorial Day the ideal time for browsing through the amazing art displays at the Paseo Arts Festival in Oklahoma City, a celebration of local art ranging from painting and photography to ceramics and sculpture. Pick up a tasty treat from an on-site food vendor, catch a live music performance and see artists at work in one of Oklahoma City’s historic neighborhoods. To recognize Memorial Day with a hearty dose of patriotism, head to the Celebration of Freedom in Hobart. A parade honoring veterans will kick off the weekend followed by a motorcycle poker run through the Wichita Mountains. A fly-in is sure to wow onlookers with military and experimental aircraft, powered parachutes and executive jets. Another way to celebrate Memorial Day with the whole family is at Oklahoma City’s Chuck Wagon Gathering & Children’s Cowboy Festival. A hilarious Old West show, stagecoach and covered wagon rides, delicious chuck wagon fare and hands-on activities for kids are just a few of the things that make this annual celebration stand out. Celebrate the Mother Road for an entire weekend at the Clinton Route 66 Festival. Browse rows of classic cars, antique motorcycles and vintage trucks on display at the event before settling down on a picnic blanket for an outdoor concert. Wiener National dog races, free hot dogs and a barbecue cook-off make this a must-see event. There are more ways to celebrate Memorial Day in Oklahoma than you can count. Watch the humorous getaway of a rodeo clown at the Will Rogers Stampede PRCA Rodeo in Claremore, shop sidewalk vendors at the Bethany 66 Festival, jam out at Rocklahoma or get your fill of ribs and brisket at the Boley Rodeo & BBQ Festival.